Waking up with stiff, aching joints could be a sign of early-onset arthritis, especially if the pain diminishes later in the day as you become more active. Far too many people resign themselves to living with painful joints and do not realize that the pain can be managed and even alleviated with the help of physical therapy and exercise. The types of exercises you can learn from a physical therapist can help you prevent further injury to the joints in day-to-day activities. You can also learn techniques for increasing your range of motion in affected joints. If you’d like to learn more about how physical therapy can reduce the pain and inflammation from arthritis, contact Sports & Orthopaedic Therapy Services in Silver Spring, MD today and schedule a consult. Arthritis is a condition in which a single joint or multiple joints in the body experience pain and inflammation. It is the number one cause of disability in the United States and impacts more than 50 million people, according to the Arthritis Foundation. There are two main types of arthritis that you’ve probably heard of. Rheumatoid arthritis is an autoimmune disease that impacts more women than men. Rheumatoid arthritis is unique in that it can impact joints on both sides of the body simultaneously. Osteoarthritis is the more common type, and that is what people usually mean when they say arthritis. Osteoarthritis is a condition caused by wear and tear on the cartilage in the joints. People with arthritis usually experience stiff and sore joints first thing in the morning, which subsides after a little while. It can also cause pain during physical activity or work, which goes away after you stop doing that activity and rest. Arthritic joints can be sensitive or painful to touch, and they also tend to be noisy joints, causing popping sounds when bending. The causes of rheumatoid arthritis are not well understood. It’s an autoimmune condition, meaning the body’s immune system has decided to attack the joints. Researchers believe it could be caused by a combination of a person’s family medical history, hormones, and environmental factors. Because it is caused by an immune response, it tends to impact the same joints on opposite sides of the body. Osteoarthritis is more straightforward and easy to diagnose. A sudden injury to a joint can lead to arthritis in that joint later in life, even if you fully recover from the injury at the time. An example of this would be a football player who sustains a knee injury: he heals from the injury, continues his career, and then develops arthritis in that knee when he’s in his 50s. If you swing a hammer all day long as a carpenter for your career, you might develop arthritis in that elbow, or in the joints of your hand, due to the repetitive nature of the work. Arthritis is actually very common in athletes who put a lot of strain on their joints and also for people whose jobs require a lot of repetitive motion tasks. Being overweight can also lead to arthritis in load-bearing joints, such as the hips or knees. Why does this happen? When a joint is in motion, the cartilage between the bones that cushions them wears down over time (or suddenly, in the case of an injury.) When the bones no longer have enough of that protective cushioning between them, it causes them to grind together, which causes the stiffness and pain of arthritis. A physical therapist will work with you to determine the best course of therapy for your type of arthritis. Most people who suffer from arthritis can benefit from working with a physical therapist, according to WebMD. Exercise is an important part of any treatment plan for arthritis, but it has to be done correctly. Your physical therapist will work with you on weight management to avoid additional strain on your joints; posture to ensure that you don’t cause further injury to joints; and specific techniques for alleviating arthritic joint pain. Thermal treatments that include ice or heat packs may be a part of the process, combined with ultrasound or other techniques. The goal is to reduce stress on the joints with arthritis, so you can enjoy a better quality of life. Put yourself on the natural, healthy path to arthritis relief. 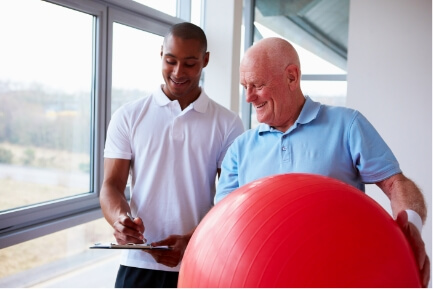 If you’d like to know more about how working with a Silver Spring physical therapist can improve your arthritis symptoms, contact Sports & Orthopaedic Therapy Services in Silver Spring, MD today to schedule a consult!